Reprinted from Bat Research News, Vol. 45: No. 1 (Spring 2004) with permission. Copyright 2004. All rights reserved. Donald R. Griffin died on November 7, 2003. Those of us who study bats, and who try to act variously as their boosters, champions and protectors, have lost a good friend and colleague. Bats have lost one of the people responsible for the change in their reputation from being feared and loathed to being seen as remarkable animals, gifted with the ability to see in the dark by virtue of prior biological development of one of mankind's significant technological achievements--sonar. The North American Bat Research Symposium will miss him as one of the pioneers of modern bat research, along with William Wimsatt and Karl Koopman. In 1938, as a Harvard University student who was engaged in banding bats to study their seasonal migrations, Griffin was aware of the puzzle--first examined by Lazzaro Spallanzani in the late 18th Century--about how bats oriented in the dark and of Hartridge's untested hypothesis that the basis was acoustic, with sounds that were inaudible to humans. Griffin had the opportunity to bring some bats to an early ultrasonic detector--the precursor of the array of modern "bat detectors" we have for monitoring the ultrasonic sounds of flying bats. It quickly became clear that active bats emitted streams of intense sounds covering a wide range of ultrasonic frequencies. In this work, Griffin described the frequency-modulated (FM) structure of the sounds, which we now know are emitted by the majority of bat species. To determine the significance of these FM sounds by testing Hartridge's theory, Griffin teamed with Robert Galambos, a student in the fledgling field of auditory physiology, which itself had originated just a decade earlier in E. G. Wever's discovery of the electrical potentials that emanated from the cochlea when it transduces sounds. In 1939-41, Griffin and Galambos carried out a series of experiments demonstrating that bats oriented by sonar, a mode of perception that Griffin called echolocation. These experiments are classic, not only to those of us who are interested in bats, but to the field of experimental biology because they established the paradigm of neuroethology whereby the sensory worlds of animals are explored. First, bats were shown to be sources of copious ultrasonic emissions. Second, the ability of bats to orient by hearing instead of by vision was confirmed by carrying out obstacle-avoidance tests under various conditions of impairment of senses. Third, the correlation between the pattern of acoustic emissions and the act of orientation was established by recording the sounds of bats with the ultrasonic detector as they flew past the obstacles. Finally, the physiological basis of ultrasonic reception was demonstrated by recording the minute electrical signals of the bat's cochlea while its ear was stimulated with ultrasonic sounds. The critical early discoveries of Galambos and Griffin had a profound effect on the reputation of bats. Henceforth, these animals would be recognized as possessing a genuine, unmysterious technical capability to be admired and studied. Griffin did his doctoral dissertation on bird migration supervised by the influential physiological psychologist, Karl Lashley, at Harvard and then was on the faculty of Cornell University (1946-1953), Harvard University (1953-1965; Chairman 1962-65), and the Rockefeller University (1965-1989). 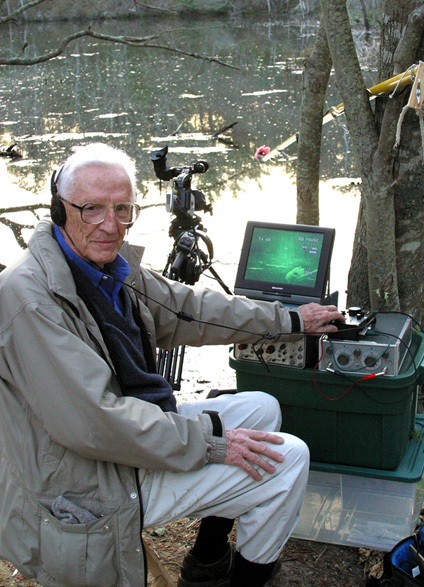 In the years following the discovery of echolocation, Griffin and his colleagues carried out a series of naturalistic experiments (deliberate manipulations of stimuli in settings where flying bats performed tasks only slightly abstracted from nature) to determine the sensitivity of obstacle detection (with Alan D. Grinnell), to measure bats' resistance to noise jamming (with J. J. G. McCue and Alan Grinnell), to characterize the structure of echolocation sounds in different species of bats, especially in the neotropics (with Alvin Novick), to demonstrate the ability to capture airborne prey and discriminate among airborne targets by echolocation (with Fred Webster, C. R. Michael, and J. H. Friend), to establish that fishing bats used echolocation to detect water-surface ripples caused by prey (with Roderick Suthers), to study the constant-frequency (CF) echolocation of horseshoe bats (with J. D. Pye), to examine the relation between wing-beats and vocalizations (with H-U. Schnitzler), to observe and record horseshoe bats in the field (with J. A. Simmons), to isolate the spectrum of echoes as a cue for discrimination of target shape (with Jack Bradbury), and to do work on cetaceans (with Peter Tyack). The study of neural mechanisms of echolocation was inaugurated by a graduate student, Alan Grinnell, and a postdoctoral researcher, Nobuo Suga, in Griffin's laboratory at Harvard. This work developed into one of the most cohesive stories to emerge in contemporary neuroscience, with a powerful comparative component in the distinction between FM and CF echolocation. Not only did Griffin's "echolocation" colleagues go on to do important scientific work on echolocation or in other areas, but a stream of additional young scientists passed through Griffin's laboratory and then went on to important developments of their own (for example, Michael Menaker, circadian rhythms; James Gould, orientation and communication by bees; Ann Grabiel, systems/behavioral neuroscience; Donald Kennedy, invertebrate neurobiology; Hubert Markl, Darcy Kelley, neuroethology). At the time of the discovery of echolocation, there were none of the books containing wonderful photographs of bats in all their variety, no calendars with bats for each month, no websites about bats, no elementary school teaching materials about bats, no Bat Conservation International--in short, no sign that bats were regarded as anything particularly worthwhile in the popular imagination. The only general book that was readily available was Glover Allen's Bats, which had been published in 1939. Miller's classic taxonomic survey of bats had been done all the way back in 1907. With his wonderfully lucid 1958 book, Listening in the Dark, Griffin changed this situation. He began by described the lives of bats and explaining why it was so difficult to determine how they oriented themselves, a difficulty he illustrated by tracing the intriguing work of Spallanzani and Jurine during the late 18th Century. Griffin recounted how he and Galambos worked to solve Spallanzani's "bat problem" and then described in detail the subsequent long series of studies on obstacle-avoidance and detection of flying insects by bats that established the overriding importance of echolocation to the biological success of bats as a group. In 1961, Listening in the Dark won the Elliot Medal from the National Academy of Sciences. At about this time, the emergence of new methods in all aspects of biological research combined with a surge in graduate education in science to enlarge the community of people studying bats. This community coalesced into the North American Bat Research Symposium at the first meeting in Tucson, in 1970. An increased public awareness about bats, including a flood of research, publications, and education on their behavior, ecology, and physiology, followed thereafter, but it was the news that bats used sonar to find their way in the dark that initiated the radical change in the way people regarded bats. The Symposium's Gerrit S. Miller, Jr. Award was given to Donald Griffin in 1979 in recognition of his role in the study of echolocation and its impact on understanding about bats. The discovery of echolocation was made near the beginning of World War II, and the succession of experiments that revealed the sophisticated nature of bat sonar coincided with the rapid wartime and postwar advances in the design of man-made radar and sonar systems. The obvious technological implications of finding that bats, and, later cetaceans, possessed sonar systems capable of high-performance in real time gave real meaning to biologically-inspired engineering. The discovery itself was greeted by astonishment and no small amount of disbelief, but the elegant behavioral experiments done by Griffin, Galambos, and their subsequent colleagues were persuasive, not only in showing that bats indeed use sonar but in recruiting many of us to join the effort to understand what bats perceive by echolocation and how their auditory systems process echoes. Griffin retired from the Rockefeller University in 1989 to a postretirement career that was as energetically pursued as his earlier career. While at the Rockefeller University, he had begun to write and study about the awareness of animals, hitherto a difficult subject for scientists to grapple with. To this end, he made video and acoustic observations of honeybees using their "dance language," recorded the activity of beavers with tiny video cameras while using microphones to study the noises beavers made in their lodges, and engaged in a large scientific discourse about animal consciousness with enthusiasm. Griffin spent his final years in Lexington, MA working at Harvard University's Concord Field Station, and on Cape Cod, where he was intrigued about a question he had first encountered as a student. In his banding studies of migration in bats, he made use of one fairly large colony of bats regularly. During that time he had never been able to determine where these bats--hundreds of Myotis--went to hunt for insects. Working with Greg Auger, who developed night-vision video methods that rendered not only the bats but also the insects visible in recordings and who actually had located the pond where these particular bats foraged, Griffin studied the relation between insect capture and the reliability of the "feeding buzz" in the terminal stage of aerial interception. He and Greg reported their findings at the North American Bat Research Symposium in Burlington, VT, in 2002. Donald Griffin was a member of the National Academy of Sciences, American Academy of Arts and Sciences, American Philosophical Society, Animal Behavior Society, American Physiological Society, American Society of Zoologists, and the Ecological Society of America. Reprinted from Bat Research News, Vol. 45: No. 1 (Spring 2004) with permission.